Home » other » Her Puppy Kept Escaping The Cage, So She Set Up A Camera. The Footage Is Hilarious! The funny thing about having more than one pet is that they often end up acting just like siblings. These two are the perfect example of a big brother and a little sister conspiring to trick their mama. 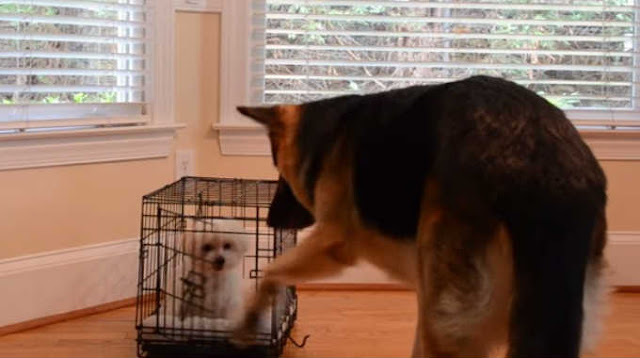 In this hilarious video, a pet parent though she kept leaving her little puppy’s crate unlatched, but it turned out there was a lot more going on than she thought. Pet parent Julie wrote that she set up a hidden camera to make sure she wasn’t forgetting to latch her 1-year-old Maltese, Sophie’s, kennel. Every time she would put tiny Sophie down for bed, she would find the pup running around with her 6.5-year-old German Shepherd, Twitch. It turned out that Julie wasn’t going crazy after all. She was latching the crate all right, but Twitch had figure out that if he took the blanket off his little sister’s cage, he could unlock it and let her free for some more play time. This is too hilarious – and also too cute! Don’t you wish all brothers and sisters got along like these two? !